The toy aisle, as we've discussed many times, is so thoroughly divided by gender it's like walking onto the set of some heavy-handed Star Trek episode about the folly of prejudice. Well, one store is a little less stereotype-driven today, thanks to one little girl's very annoyed face. Pretty sure literally every member of the Jezebel staff makes this face at least once a week. (Conservative estimate.) Maggie gets it. She spotted the sign, according to her mom, and huffed, "Well that's wrong! Anybody can like superheroes, they're being stupid aren't they?" They sure are, Maggie! But they wised up once the photo started going viral, promising to pull the sign. 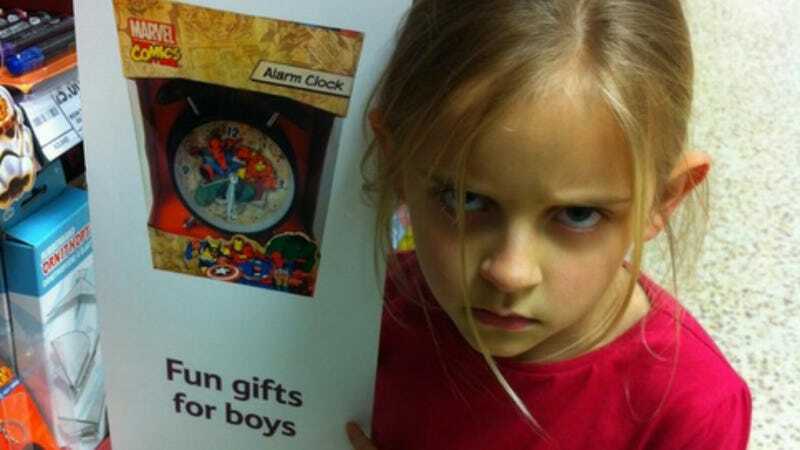 "This alarm clock would make a great gift for both girls and boys. The sign has been removed and we're sorry if it caused any confusion," a Tesco spokesperson told BuzzFeed.